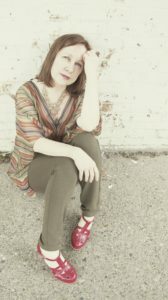 Nationally renowned singer, guitarist, pianist, and songwriter, Iris DeMent, will perform at the historic Astra Theatre in Jasper on Friday, March 22 as part of the 2019 season of Next Act, Inc. Doors for this performance will open at 6:30 p.m., opening performer Pieta Brown will go on at 7:30 p.m., and DeMent will take to the Jim and Pat Thyen Performance Stage at 8:30 p.m.
Tickets are on sale now at http://www.astratheatre.eventbrite.com. Main floor and balcony tickets are $24.95 and VIP packages are $39.95 (includes preferred seating, reserved parking, and a free drink voucher for the performance). Season ticket holders are guaranteed main floor seating. Next Act will reach out directly via email to those with season tickets. Business members will also be contacted with information about their ticket discount for employees. DeMent defies easy categorization, writing and performing music associated with divergent genres such as Country-Folk, Americana, Gospel, Folk, and Alternative Country. Her music and performance has been used by such movie producers as the Coen brothers for their 2012 film “Ture Grit.” She has appeared on albums with John Prine, Jools, Steve Earle, and Emmylou Harris. In 2017, DeMent received the “American Trailblazer Award” at the annual Americana Music Honor & Awards. An Arkansas native, DeMent grew up in Los Angeles. She married singer-songwriter Greg Brown in 1992. They live in Iowa with their adopted, Russian-born daughter.